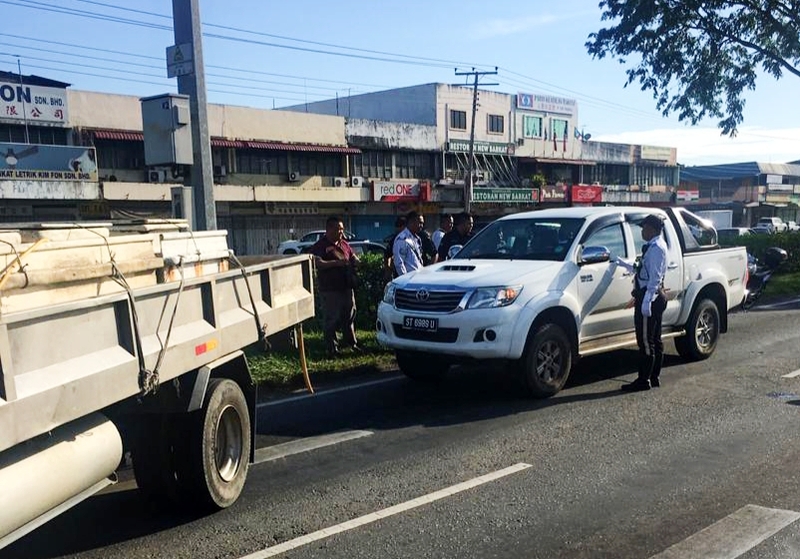 Traffic policemen approaching the Toyota Vigo with the suspect inside near the traffic lights of Mile 3 Apas Road yesterday. TAWAU: A wood factory and two blocks of workers’ quarters at Mile 5 Apas Road were destroyed by fire early yesterday morning, believed to have been started by a worker who was reportedly mentally ill.
Tawau Fire and Rescue Department station chief Sharudy Delamin said firemen were able to control the fire at Syarikat Anjur Juara Sdn Bhd by 6.12 am. He said the factory and workers’ quarters that housed ten workers were totally destroyed in the fire, adding that two fire engines and 13 firemen were involved in putting out the fire which ended at 10 am. No one was reported hurt in the incident, he said, and the cause of the fire is still being investigated. Mwanwhile, Tawau police chief ACP Fadil Hj Marsus said the fire at about 4.50 am at Kongsi 8, was caused by a carpenter of the company, which was witnessed by a worker who saw him lighting the fire using black plastic material used for wrapping wood. The 33-year-old Indonesian suspect was believed to be mentally ill as earlier he was found to be behaving abnormally and was then asked to take a rest by the employer as he was showing signs of depression, said Fadil. While efforts were being made to put out the fire, the suspect took off in the employer’s Toyota pickup and fled the scene. However, he was stopped by traffic policemen at the traffic lights at Mile 3 Apas road. Prior to that the suspect had reversed into a Proton car belonging to a woman who was on her way to work. The fire at the wood storage warehouse, workers’ quarters and office caused an estimated loss of about RM250,000, said Fadil. The case is being classified under Section 117 and 379A of the Penal Code and the suspect will be remanded under Section 117 of the Criminal Code Procedure.